The hand of God’s providence can reach even as far as your computer screen. Ian was a recent graduate of Thomas Aquinas College, finishing up a second Bachelor’s degree in Diesel Mechanics at a school in Montana. Disheartened from few dates in such a remote location, he signed up for CatholicMatch. Around the same time, Katherine had tentatively joined CatholicMatch after constant prodding from a good friend--only with a free trial account, as she felt certain it wasn’t something to be taken seriously. Fast forward to a few messages from Ian that left Katherine feeling bad about her initial lack of interest; she worried about being perceived as rude. 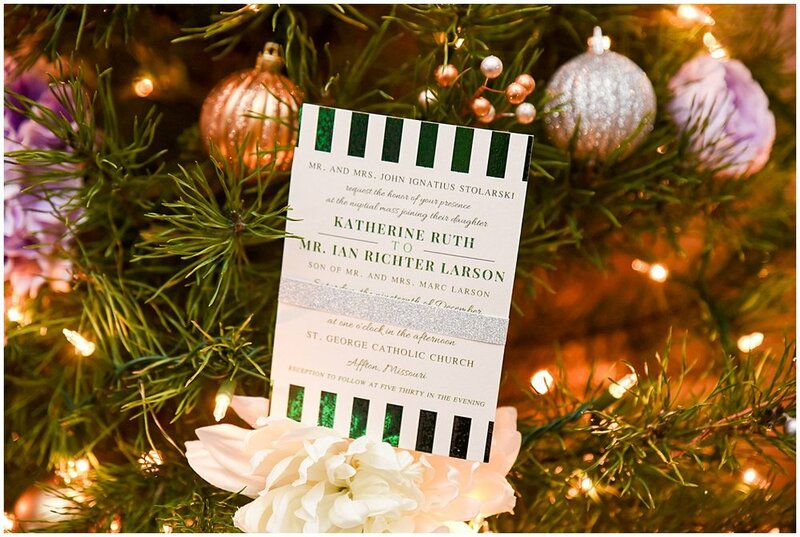 After watching her agonize over it, the same friend who encouraged Katherine to sign up for CatholicMatch took it upon herself to send Ian Katherine’s phone number. A few days later, she got a text from him, and they haven’t stopped since. From the Bride: We talked about our faith, about our families, about our friends; literally everything. We wrote so many letters. Finally, just after my sister’s wedding Ian came to visit and meet my family. I told him I wouldn’t consider us to be dating until we’d met in person, and had my parents’ approval. Many prayers, anxious jitters, and pages of text messages later, my family approved and we were official. After, that Ian and I took turns visiting each other every few months. We prayed about our vocations constantly, and we tried to use our long distance as fruitfully as possible to serve each other well in the discernment process. When it came time for Ian to pop the question, I wasn’t a bit surprised. He’d been telling me for months that he’d never been so sure of anything in his life. He was certain our prayers were answered that we were meant to be. Ian was so excited to propose and can’t keep a secret to save his life-- so much so that he informed me when the ring was purchased, and when it was supposed to arrive! He came to visit me that weekend, and after pretending nothing was up for about 30 agonizing minutes, he got down on one knee and held out the ring without a word. His expression said everything. 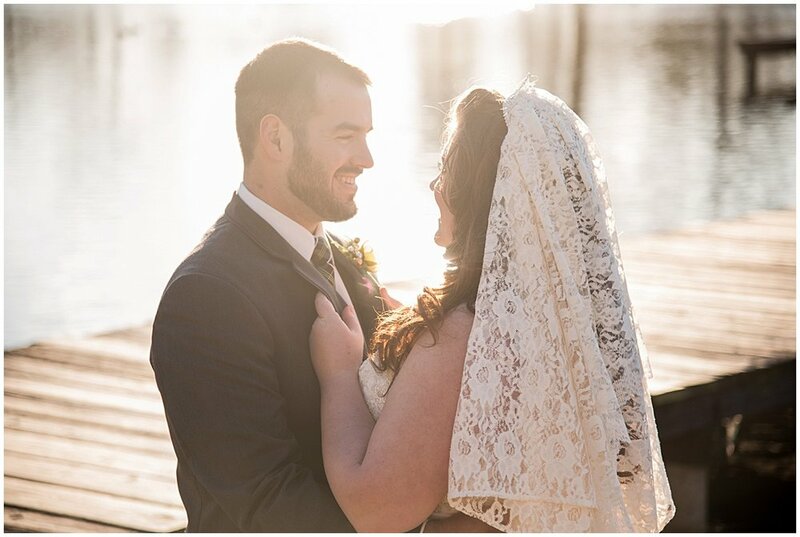 For someone who is incredibly shy, I wasn’t nervous at all on the day of my wedding. I spent the morning getting ready with my mom, bridesmaids and close girlfriends who were in town for the wedding. 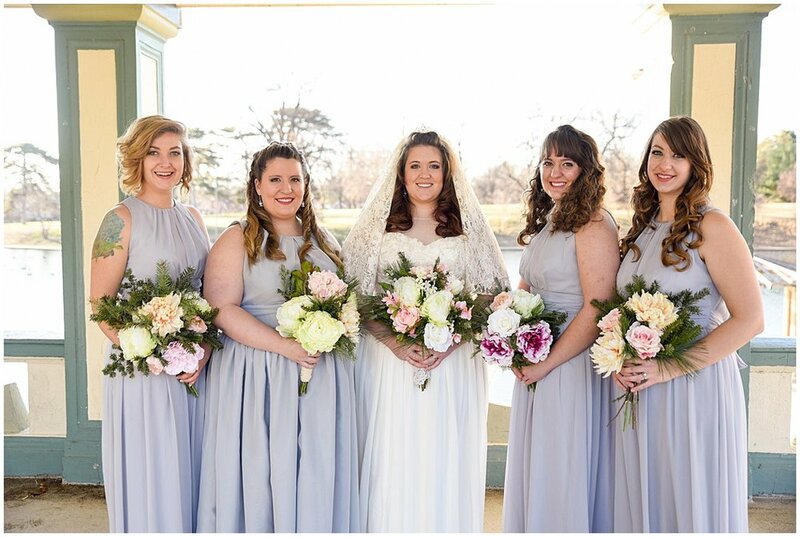 I did my mom’s and two of my bridesmaids’ before I had even finished my own and almost walked out the door with hot rollers still in my hair! I was just so happy for the big day to have finally arrived, and there were so many details I was looking forward to sharing with the people I love so dearly. 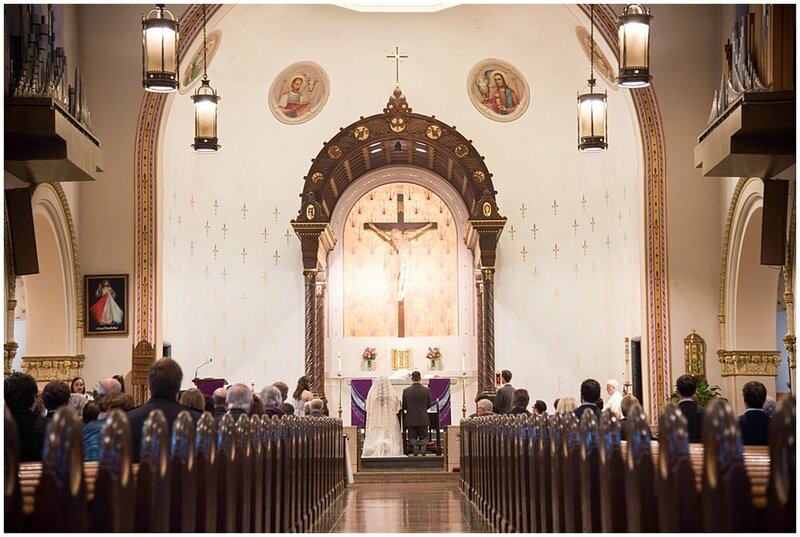 We got married at St. George, the same parish where I had been baptized, had my first Reconciliation, and received my First Holy Communion. It felt like hours as I waited for the bridal processional to start, and all the nerves I thought I had left behind came surging back. 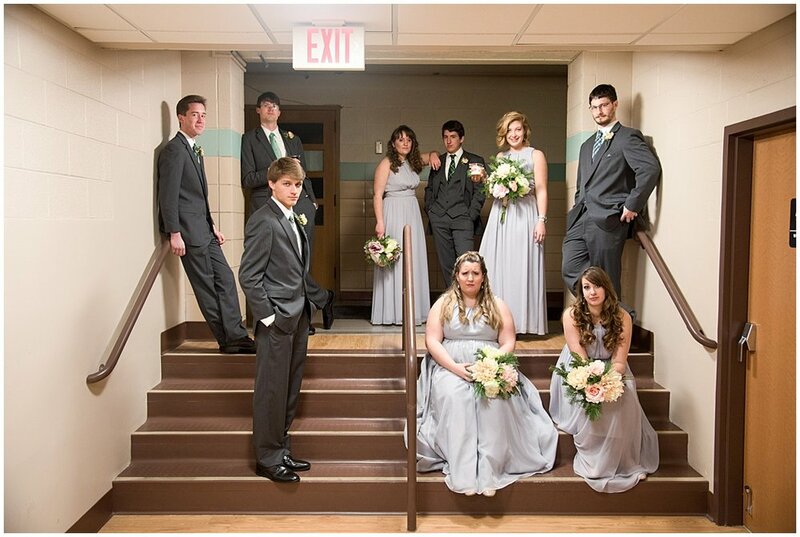 I just wanted to get down the aisle and hold my best friend’s hand. I knew my dad would be holding back tears as he walked me down the aisle, and the thought of it was making me choke up. I was so nervous to get started that I got mixed up and we went before our cue! 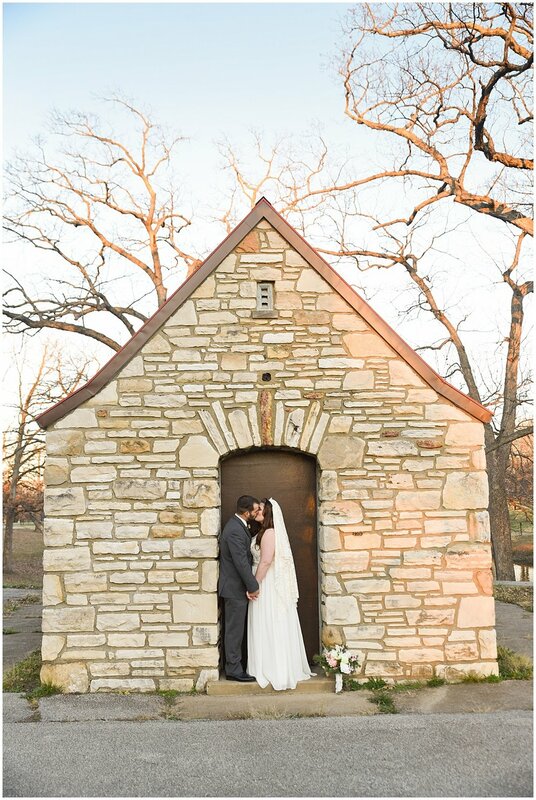 As soon as I got to the altar and was with Ian, all of my nerves melted away. All that mattered then was that we were here, in front of God to enter into this holy sacrament of matrimony. 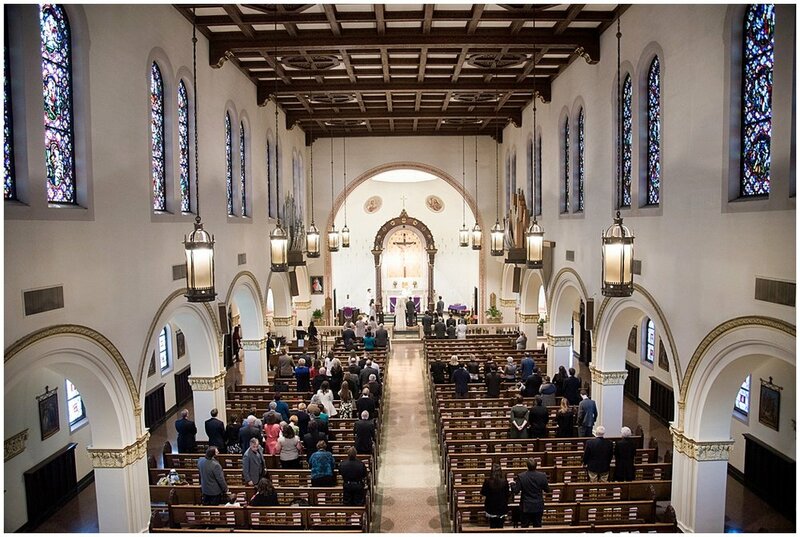 My favorite part of our wedding Mass was during our vows. I thought for sure I wouldn’t be able to look Ian in the eye and get through all of it without crying, but somehow I made it. To my surprise, I could tell Ian was starting to tear up. He was saved by an amusing difficulty with the rings. Our ring bearer was Ian’s brother Anton, who has Down’s Syndrome. We wanted him to actually carry the rings, so my bridesmaids tied them very simply and made sure to show the Best Man how easy they’d be to untie. But when the time came, he struggled to get the rings free. Even with Father’s assistance, it took a few minutes to figure everything out, which gave Ian just the right amount of time to compose himself. Then, as if to seal the deal and help Ian avoid pausing for tears, our priest dropped one of the rings as he blessed them. The ping as it bounced around on the floor had me shaking and trying not to laugh. It just seemed so perfect; such a reminder that even though this life and this vocation we had chosen was serious business, it would also be filled with laughter. 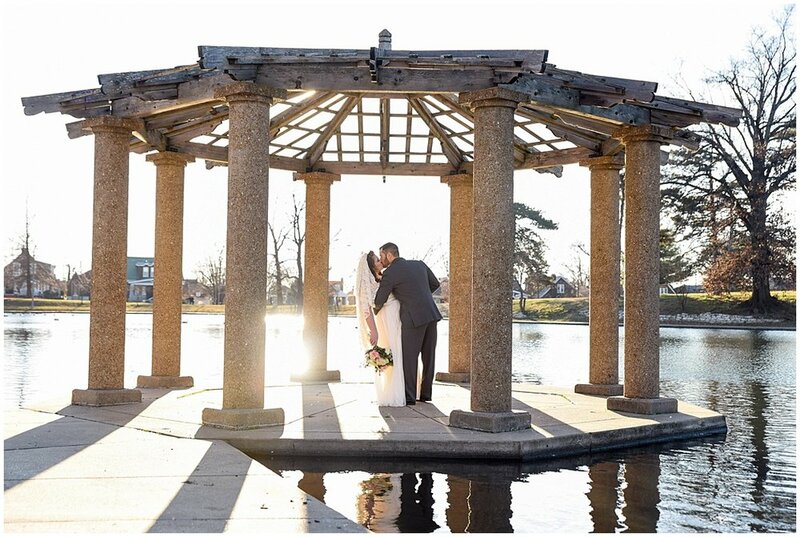 We wanted our wedding to be three things: beautiful, budget friendly, and DIY. From the invitations I designed, printed and arranged with my sister’s help of my sister (I even hand-painted the decorative elements on each RSVP card) to the décor and all of the flowers, we did everything ourselves. I’m a big planner. After doing lots of research, I found that for the size of wedding we’d have, it would actually be much more affordable to buy linens instead of rent them. 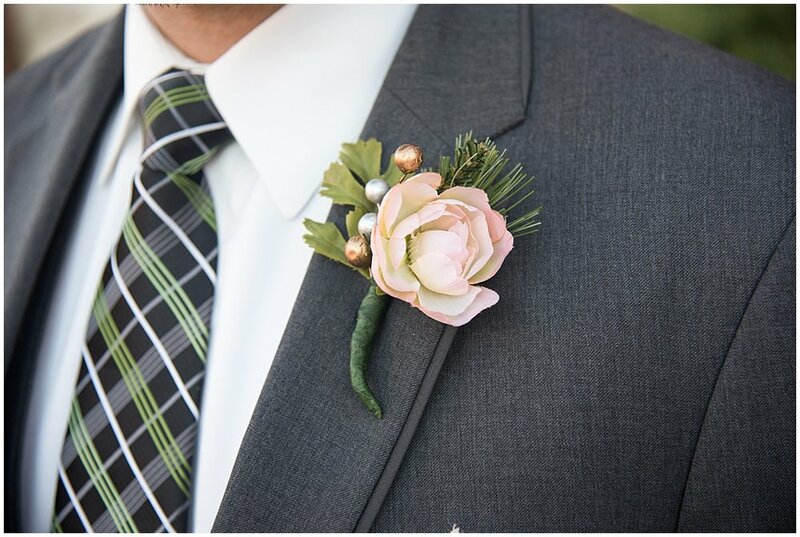 The centerpieces and bouquets were made up of silk floral stems I had found on sale at the end of the summer and evergreen branches we gathered from tree lots. Using lighted garland, sprinkled with beautiful faux peonies, hydrangeas, ranunculus, and more for the head table made such a statement as our guests entered the reception. We made things elegant and clean-up friendly by using wine glasses as favors. We even incorporated a little family history into our décor: using a low table and a evergreen tree we’d decorated, we created a corner featuring photos of our parents’, grandparents’, and great grandparents’ wedding days. Our wedding was catered entirely by my mom. She is an avid baker as well as a cook, so she was excited to make the our giant spice cake. Since cooking and baking is a labor of love for her, she was so happy to be able to gift her hard work to Ian and I on our wedding day. With her team of friends and her grown children, she made the best food I’ve ever had at a wedding. 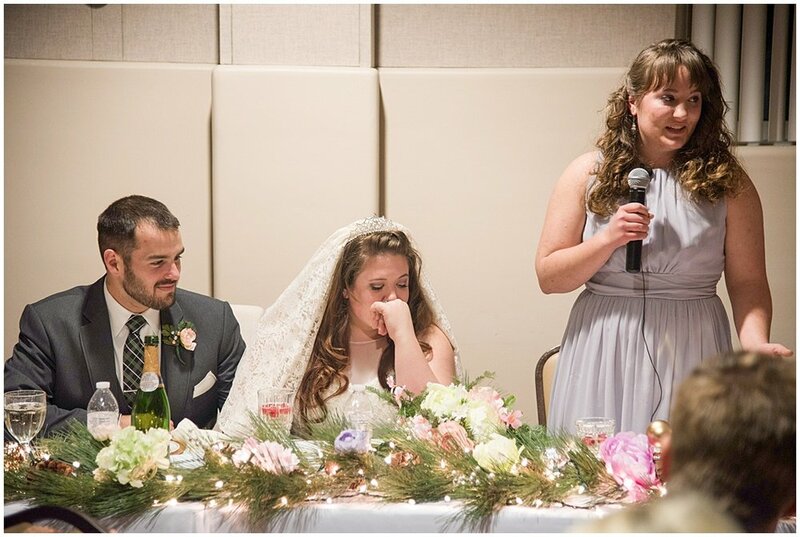 When the time came to save the top layer of our wedding cake, we learned that traditionally the top of the cake was saved to be pulled out again at the baptism of the couple’s first child! As it happened, Ian and I welcomed a baby girl the September after we were married. She was baptized four days after our anniversary, so we did eat the frozen cake-top for our anniversary and our daughter’s baptism! From beginning to end, our wedding was a family affair. It was overwhelming in the best way to be surrounded with loved ones there to support us, first in our marriage, and then in celebration afterward. It was a powerful reminder of how we are to live in communion in the Church. People were pitching in using their special gifts and talents everywhere you turned; from my mother’s delicious food and beautiful cake, my in-laws’ voices, which assisted in our prayers at the Mass, my two uncles’ filling the roles of DJ and MC, and my very-extroverted younger brother’s perfect fit as the bartender. It was the best wedding day I could’ve ever imagined, and I was so proud of how it turned out. From the early planning stages we wanted our wedding to be a gift of ourselves to our families and loved ones, and not just a great party. We wanted to put in the work and to be frugal where we could and splurge where we ought. This outlook seemed like a great challenge that would prepare us for married life. I never thought preparing for such a big change in my life would be such a peaceful experience. Ours was exciting and relatively stress-free from start to finish, thanks to lots of prayer and reminders of what is truly important. Even the things that went “wrong” or didn’t go as planned didn’t matter because at the end of the day, we would be married.